$162.50 Out of stock. Email me when new stock arrives. 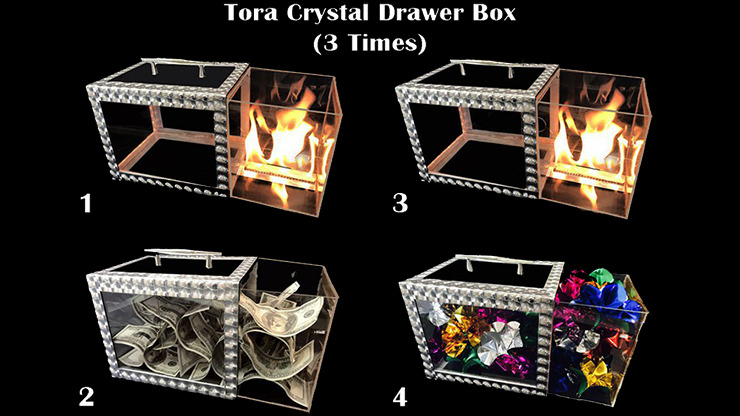 If you are looking to get audience attention and not let go, then check out the Tora Crystal Production Box! It's so hot, it catches on fire! Imagine showing a transparent box. But when you pull out the drawer, the drawer catches on fire! Now you close the box and the box instantly fills with colorful flowers (or other objects of your choice!). Empty the box and the drawer catches fire again. Close the box and the fire again disappears to be replaced by money! This is easy to perform but packs quite a punch! Purchase yours today!